India’s health sector continues to be challenged by overall low levels of public financing and disproportionate reliance on private resources. High out-of-pocket (OOP) spending by households, almost 60 percent of total health expenditure, restricts access to quality health care for many low-income families and threatens to impoverish them. The current national government has shown political will to implement major health sector reforms in pursuit of universal health coverage (UHC). Demand-side financing, where money follows the patient, through government-funded health insurance (GFHI) schemes is a key vehicle of this pursuit. To this end, the Ministry of Health and Family Welfare is preparing to roll out, in 2017, an expanded version of Rashtriya Swasthya Bima Yojana (RSBY), the government’s flagship health insurance scheme that covers about 34 million below-poverty-line (BPL) households, or about 119 million people. The new National Health Protection Scheme (NHPS) will cater to a substantially greater number of people. Several state governments have also launched GFHI schemes for poor and vulnerable families. Some state schemes, such as the Aarogyasri scheme launched by the Andhra Pradesh government in 2007, have gained significant popularity, going on to expand and inspire others. Currently, 20 states are implementing their own schemes, either to complement RSBY or as a standalone scheme. At the local level as well, several community-based health insurance (CBHI) schemes are functioning as community-led health financing and risk-pooling programs providing financial protection to members. 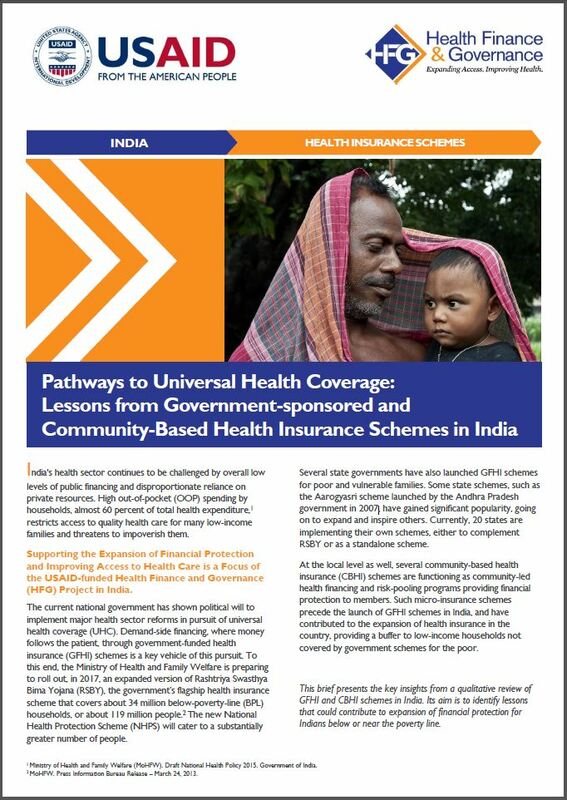 Such micro-insurance schemes precede the launch of GFHI schemes in India, and have contributed to the expansion of health insurance in the country, providing a buffer to low-income households not covered by government schemes for the poor. This brief presents the key insights from a qualitative review of GFHI and CBHI schemes in India. Its aim is to identify lessons that could contribute to expansion of financial protection for Indians below or near the poverty line.